← How to set the page width while converting html to pdf? It becomes an very easy thing to set the width and height of web browser when you convert html to jpg format by using HTML Converter Command Line.Because you can set many kinds of parameters for the target file according to your requirements such as width,height,resolution,etc. only by some DOS commands. If you don’t know what is HTML Converter Command Line,this article will introduce it to you and tell you how to install and register it in your computer.HTML Converter Command Line is a powerful HTML conversion product. It allows you to create previews or thumbnails of web pages in a number of different formats, such as TIF, TIFF, JPG, JPEG, GIF, PNG, BMP, PCX, TGA, JP2 (JPEG2000), PNM, etc. It also allows you to convert web pages to PDF, PS (postscript), WMF, EMF vector formats.You can download HTML Converter Command Line at http://www.verypdf.com/htmltools/htmltools.zip. 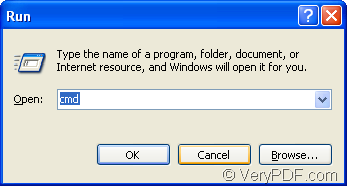 Just unzip the software to some location in your computer and the location is the installation directory of HTML Converter Command Line.Then you should run cmd.exe program by clicking “start”—“run” and input “cmd” in “open” edit box,clicking “OK” button.Please see Figure1 and Figure2. You will see cmd.exe dialog box pop up.Please change the current directory to the installation directory of HTML Converter Command Line by DOS command “cd”.You should input cd C:\Documents and Settings\admin\Local Settings\Temp\htmltools and click “Enter” button on your keyboard.Please see Figrue3. Then you can input the register code which you get when buying HTML Converter Command Line online.After that,all the functions of the software will be without any limitations. Next,you can input your command line to convert html to jpg format and set the width and height of the web browser.Please don’t close the cmd.exe dialog box you have just opened.If the window is a little disordered,you can input “cls” and press “Enter” button to clear the screen. htmltools.exe stands for the called program in the conversion of html to eps.It is the executable file in HTML Converter Command Line. –bwidth value –bheight value stands for the width value and height value of browser. “www.verypdf.com” can be seen as source file. output.jpg stands for the target file. Please see Figure4.It is the example of the commands about the conversion of html to jpg. "C:\Documents and Settings\admin\Local Settings\Temp\htmltools\htmltools.exe" is the path of htmltools.exe,which you can drag into cmd.exe dialog box directly. -bwidth 30 -bheight 40 is the value of width and height which you can set as your needs. 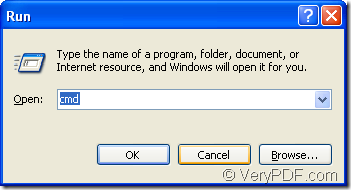 “www.verypdf.com” is the URL of some webpage which you should input or copy in the dialog. verypdf.jpg is the name of target file which you can define yourself but don’t forget the extension name. The last step is finding the target file in current directory.If you want the target file saved in a suitable location in computer,you can specify the directory in command line. How to print html to jpg? How to rotate pages when convert HTML to JPG? How to set bit depth when batch convert HTML to JPG? How to set color depth when converting HTML to JPG? How to convert html to jpg format? How to insert PDF pages and convert URL to PDF? How to convert html to ps format? Does your latest version of HTML to PDF Converter support creating a pdf file from an aspx web page? How to convert an emf to gif format? How to convert an image of emf to ps file in a command line? This entry was posted in HTML Converter (htmltools) and tagged html to jpg. Bookmark the permalink.